HOESCH whirltub Avventura (Deluxe Air) offers you 14 air jets in the floor, that help to vitalise your body and to improve your blood circulation. The visible whirl components are available in chrome or stainless steel finish. The massage can be adjusted individually. An interval feature is available at your fingertip. The Deluxe system represents the highest possible standard of hygiene: While the tub is filled, the rigid pipe system with closed jets is first pre-rinsed with disinfectant and then with fresh water. 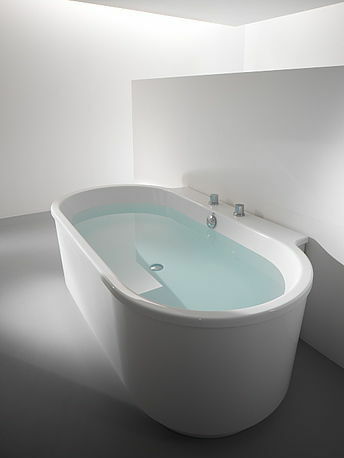 Choose one of the automatic whirl programmes, sit back and indulge yourself in a perfectly cleaned tub.